I have an abiding memory of visiting Selborne Park soon after it opened, and I immediately fell in love with the unique, if somewhat quirky, layout. There’s a lot to like about the place; not least of all the tranquil, country feel, the undulating terrain and the profusion of indigenous trees. I have fond memories of being shown around by developer Denis Barker, who was justifiably proud of his achievement. Barker had envisioned a rather special estate with a golf course – on real estate that was well- suited to the creation of an interesting layout that required some accurate shot-making. 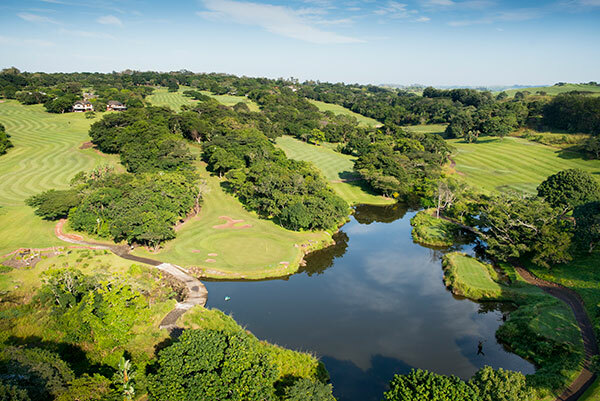 This was, after all, the first purpose-built course as part of a golf estate in South Africa, and it set standards that many estates would try to match in the years that followed. Firstly, the low number and sensible positioning of residential sites meant that the homes would not detract from the natural beauty of the golf course, which had the advantage of having areas of magnificent, unspoiled coastal forest. After meeting Barker and spending some time with him in the years to come, it was clear that his passion for this creation never waned, and we would often debate the vagaries of course rankings, design philosophy and, like typical golf nuts, we just enjoyed talking about golf courses and the game in general. Over the years I have had the pleasure of playing at Selborne quite often, and I can honestly say I have enjoyed the course more every time. The layout was never designed to be a fierce championship test, but despite being short and eminently playable, the changes in elevation, tight landing areas and optical illusions will keep even the best players guessing. The par-three, stroke-18 13th hole is one of four excellent short holes, and even at full stretch (only 137 metres), regulation figures can never be taken for granted. I can’t imagine any golfer not thoroughly enjoying playing here, and when the wind blows, the course really comes into its own. Overcoming the challenges of club selection becomes even more fun as scoring becomes more difficult. This magnificent property of some 80 hectares was originally owned by Lord Selborne, who was Britain’s Under-Secretary for the Colonies and first came to South Africa to succeed Lord Milner as High Commissioner. The land was later acquired by Reynolds Bros Ltd, the company that operated the nearby Sezela sugar mill. In 1954, the magnificent manor house (now part of a hotel) was completed by sugar baron Vernon Crookes as a home for senior executives of his company, and when he retired in 1964, he bought the property for his personal use. In 1979, when the estate was owned by Crookes’ widow and came up for sale, Barker bought the property and established a stud farm, breeding Jersey cattle. It was after a trip to the United States in 1982 that he first played golf on a residential estate, and he began to consider converting his farm into South Africa’s first golf estate. It took three years for the necessary planning permission to be granted, and two years after that the course was unveiled. Barker was well-travelled, and made a study of course architecture, and it must be said that while many golf estates were developed with modern courses designed by some marquee names, few have managed to create a course with such an endearing character. The 5th hole is an excellent par four which, like most of the holes on this layout, looks a lot easier than it plays. The design and construction of the layout was very much a family affair, with the developer’s son Gary, now a respected golf course consultant, helping out with the building of the course. As Gary Barker points out, the original plan was to use the original meadow grass, kikuyu, for the fairways, but because of the high humidity, this imported grass became stressed and the indigenous cynodon thrived. The resulting blend of turf is a perfect surface from which to play, which is all golfers really want. The Paspalum-clad greens have endured periods during which they became a little patchy. 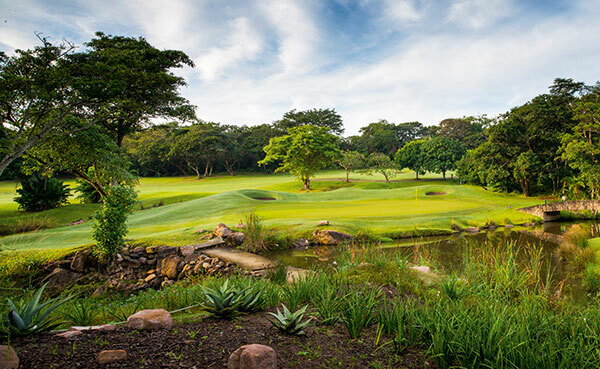 Under the watchful eye of course superintendent Hein Labuschagne, however, they have improved dramatically and in terms of generally neatness, this course cannot be faulted. 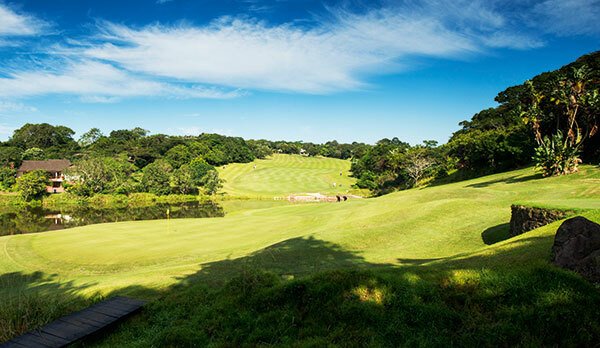 The opening hole is a short par five, just a little over 400 metres, that doglegs to the left, and even the shorter hitter will enjoy the prospect of getting close to the green in two. But as every golfer will soon discover on this course, missing the fairway will be costly. The next hole is a driveable par four, but the wise play for most would be to hit an iron off the tee, which will leave a comfortable approach with a wedge. A much stronger par five follows – depending on the prevailing wind the green can be reached with an accurate second shot but water, bush and out-of-bounds await an over-ambitious approach. As the round progresses, one can appreciate just how logically the course is routed, and importantly, there is a sensible balance between the reward for accurate shot-making and brute strength. What is likely to strike the first-time player here is the wonderful variation of holes; each very different yet they all fit together perfectly. The par threes are particularly good – the shortest is a mere 119 metres long, and the longest only 152 metres, but all four are a joy to play. First impressions are always important, and from the time visitors enter the gates of the estate and travel the short distance on a winding road to the imposing but tasteful manor house, they cannot fail to be impressed. Unlike at some of our high-density estates, one’s senses are not bombarded with architectural monstrosities that serve as homes for the well-heeled, and one could believe that this is an exclusive private club somewhere in England. Not only is club selection tricky on the par-three 6th, but missing the green in the wrong place can mean trouble. Entering the manor house, where the entrance hall now functions as the reception area for the hotel and lodges, one is struck by the beautifully crafted staircase and oak panelling, and all that seems to be missing is the butler in full Victorian livery. The evolution of Selborne has been interesting and not without a few low points in its history. Initially, old converted railway carriages served as change-rooms and the halfway house, and the seven-room manor house served as the members’ clubhouse. In 1989, the new clubhouse was completed, and in 1992 nine garden suites were added. A conference centre was also constructed. In 1996, Grinaker-LTA purchased the estate, and what had been a guesthouse was extended to a 52-bedroom, four-star hotel managed by Southern Sun. In 2001, a consortium, which included members of the Barker family, bought the estate, but after they sold their share in the consortium, the course went through a period during which it was clear that its conditioning was not a priority. What didn’t help was when the course was subjected to some severe flooding after heavy rains in the region. The good news is that the homeowners have taken ownership of the club, and the Orion Group now manages the hotel. As a ‘stay-and-play’ destination, it doesn’t come much better than this. The uninitiated golfer might wonder how a par-72 course that measures less than 6 000 metres, with its reachable par fives and two driveable par fours, can resist being overpowered, but it does. It will certainly entice you to come back and attempt to bring the layout to its knees, and even if you don’t succeed, you’ll have a great time trying. GETTING THERE: A 45-minute drive on the N2 heading south from Durban brings you to the Esperanza/Sezela off-ramp (Exit 93). Turn left onto the R102 and continue for 3km. COURSE: Classic coastal parkland, 18 holes, par 72, 5 952m (championship tees). GREENFEES: Affiliated – R250, non-affiliated R300. 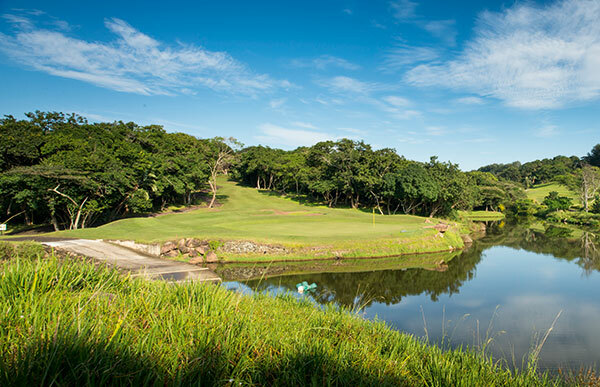 ■ This layout offers the perfect balance between playability and shot values. ■ The indigenous trees and truly impressive birdlife, as well as the prospect of spotting the odd bushbuck or duiker. ■ Friendly and helpful staff, and unbeatable value for money. ■ The distance from where I live, because I would love to play here more often.